Use these basic youth softball rules and enjoy a popular game enjoyed by players of all ages. Organize a game of your own or prep yourself to cheer on your young player at her next game. Softball is a sport derived from baseball, so both sports share many similarities. the game is played on a smaller field. a larger ball is used. the ball is pitched underhand. both males and females play the game, where baseball is predominantly played by males. games consist of 7 innings. Softball is played by two teams of 9 players each who try to score more runs than their opponent by rounding the bases and crossing home plate as many times as possible. The batting team stays up to bat until the fielding team puts out 3 batters. A softball field consists of a pitching rubber, 4 bases (3 bases plus home plate), an infield, and an outfield. 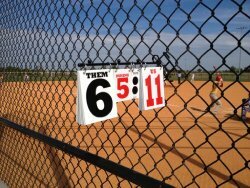 The National Softball Association (NSA) provides specific details about the softball field dimensions and softball rules for both slow pitch and fastpitch youth and adult leagues. 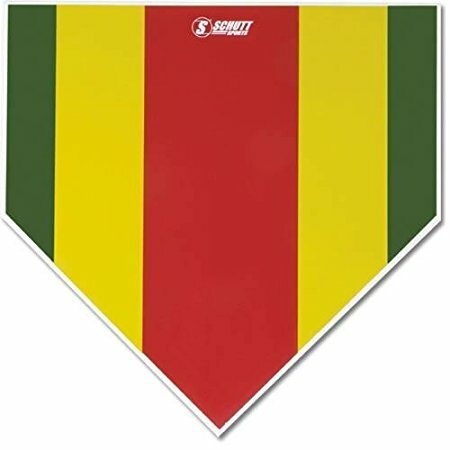 You need a bat, a softball, softball gloves for each fielder, 4 bases, and a pitching rubber. The visiting team bats first while the home team starts out in the field on defense. Each fielder lines up in one of the 9 fielding positions. The first batter steps into the batter's box and prepares to hit the pitch. A batter's box is located on both sides of home plate. The batter may choose which side of the plate to hit from, but both of her feet must be inside the box. She attempts to score runs by hitting the ball when it's pitched to her. hits the ball in fair territory. fails to swing at a pitch that crosses the plate in the strike zone. swings at a pitch and misses. hits the ball out of bounds with fewer than two strikes against her. Once she gets 3 strikes she is out, and the next batter comes up to the plate. A batter can't strike out on a foul ball. If she has two strikes, there's no limit to the number of foul balls she is allowed to hit. She can only strike out on a swing and miss or a ball she fails to swing at in the strike zone. A "ball" is a pitch that is delivered outside of the strike zone that is not struck at by the batter. If a batter receives 4 balls, she gets to walk to first base. If a batter swings at a ball outside the strike zone and misses, she is called for a strike. she hits a ball in fair territory and runs to first base. she walks after 4 balls. she is hit by a pitch. A runner can move to the next base if the ball is overthrown or after a wild pitch. A runner may overrun 1st base when she hits the ball as long as she turns out of bounds after she passes the base. Runners may not overrun any other base. If they do and are tagged while they are off the base, they are out. A standard game lasts 7 innings. Each inning is divided into a top and bottom half with each team having a turn at bat. The visiting team bats the first half (or top) of each inning, and the home team bats the second half (or bottom) of the inning. A half inning is completed when the batting team gets 3 outs. If the score is tied at the end of 7 innings, extra innings are played until there is a winner. If the home team is ahead going into the bottom of the 7th inning, there is no need for them to come up to bat, so the game is usually called at that time. The team that scores the most runs is the winner. A run is scored when a base runner rounds all of the bases by stepping on each one in order from 1st, 2nd, 3rd, and crosses home plate. If the ball is hit over the outfield fence in fair territory, it is considered a home run and the batter has a free trip all the way around the bases until she crosses home plate. Grand slam - A home run that's hit with the bases loaded (runners on every base.) All of the base runners round the bases and go home for a total of 4 points. she is hit by a batted ball while off a base. 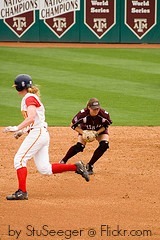 a fielder tags her with the ball when she is not touching a base. she runs more than 3 feet out of the baseline to avoid being tagged. a fielder with the ball tags a base at which there is a force play before the forced runner reaches the base. she fails to tag up and is thrown out. she runs past a base runner that's ahead of her. Double play - When 2 players get out on the same play. Triple play - When 3 players get out on the same play. Force play - When a batter hits the ball and runs to 1st base, she forces the runner on 1st base to move to 2nd base. If there's also a runner on 2nd, she must move to 3rd base, and if there's also a runner on 3rd base, she must run home. A runner is out if she is tagged by a fielder before reaching the base she is forced to run to or if a fielder with a ball touches the base before she gets there. Steal - When a runner runs to the next base without the ball being hit. The runner may not leave the base until after the pitcher releases the ball. The runner is out if she is tagged with the ball before reaching the base. Tagging up - When a fielder catches a fly ball, a runner cannot leave the base until after the ball hits the fielder's glove. If she leaves the base too early, she has to go back and touch the base before she can run to the next base. If the ball gets to her base before she returns to tag up, she is out. *Rules Of The Game: The Complete Illustrated Encyclopedia of All the Sports of the World provided an excellent resource for the softball rules listed on this page. I highly recommend it if you're looking for basic rules for all kinds of sports. Add more fielders. In youth leagues and adult recreational leagues, it's common to play with a 4th outfielder. Reduce the size of the field. Reduce the number of bases. Use a bigger or softer ball that you can catch without a glove and hit a little easier. Hit the ball off of a batting tee instead of pitching it. Give each player 3 strikes to hit a pitched ball and then give her 3 strikes using a tee. Allow every player on a team to bat before changing sides instead of playing 3 outs. Put a limit to the number of points a team can score each inning. When they reach their limit, the teams exchange places. Don't call balls or strikes. 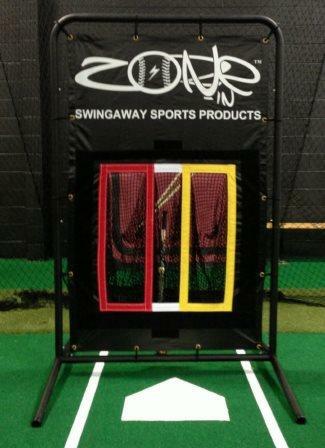 Give each batter 3 swings at the ball. On each hit, allow the batter to run the bases all the way to home. If she reaches home before the hit is fielded and thrown around to every infielder and back to the pitcher, she scores a point. These are just a few ideas for changing the basic youth softball rules to fit your needs. Maybe they'll give you some ideas for adapting the game to make it more fun for your group. To find some fun kids sports activities that include modified softball games, check out our list of free kids games.